Due to recent studies, quinoa is regarded as a new food resource with great benefits for human beings. Due to its high value in nutrients, this kind of wheat is being exploited in the food industry as a new food resource. However, currently some questions relating to quinoa have been raised: (1) How to scientifically exploit and process quinoa? (2) What are the functional nutrients in quinoa? (3) What are the bottlenecks for quinoa processing? (4) How to eliminate or mitigate the technical bottlenecks for quinoa? Without answering these questions, the academic research and industrial application of quinoa would be negatively impacted. Casas Moreno, Maria del Mar, Vivian Barreto-Palacios, Rebeca Gonzalez-Carrascosa, Consuelo Iborra-Bernad, Amparo Andres-Bello, Javier Martínez-Monzó, and Purificación García-Segovia. 2015. “Evaluation of textural and sensory properties on typical Spanish small cakes designed using alternative flours.” Journal of Culinary Science & Technology no. 13 (1):19-28. Chepstow-Lusty, Alex J, Michael R Frogley, Brian S Bauer, Melanie J Leng, Karin P Boessenkool, Christopher Carcaillet, Adam A Ali, and Alain Gioda. 2009. “Putting the rise of the Inca Empire within a climatic and land management context.” Climate of the Past no. 5 (3):375-388. Covey, R Alan. 2008. “The Inca Empire.” In The handbook of South American archaeology, 809-830. Springer. Gélinas, Pierre, Carole M McKinnon, Mari Carmen Mena, and Enrique Méndez. 2008. “Gluten contamination of cereal foods in Canada.” International journal of food science & technology no. 43 (7):1245-1252. Good Food World, 2013. Quinoa: The Passion and The Politics. http://www.goodfoodworld.com/2013/08/quinoa-the-passion-and-the-politics/. Jacobsen, S‐E. 2011. “The situation for quinoa and its production in southern Bolivia: from economic success to environmental disaster.” Journal of Agronomy and Crop Science no. 197 (5):390-399. James, Lilian E Abugoch. 2009. “Quinoa (Chenopodium quinoa Willd. ): composition, chemistry, nutritional, and functional properties.” Advances in food and nutrition research no. 58:1-31. Malpass, Michael A. 2009. Daily life in the Inca Empire: ABC-CLIO. Obizhaeva, Anna A, and Jiang Wang. 2013. “Optimal trading strategy and supply/demand dynamics.” Journal of Financial Markets no. 16 (1):1-32. Peterson, Adam J, and Kevin M Murphy. 2015. “Quinoa cultivation for temperate north america: considerations and areas for investigation.” Quinoa: Improvement and sustainable production: 173-192. Repo-Carrasco-Valencia, Ritva, Jarkko K Hellström, Juha-Matti Pihlava, and Pirjo H Mattila. 2010. “Flavonoids and other phenolic compounds in Andean indigenous grains: Quinoa (Chenopodium quinoa), kañiwa (Chenopodium pallidicaule) and kiwicha (Amaranthus caudatus).” Food Chemistry no. 120 (1):128-133. Ruiz, Karina B, Stefania Biondi, Rómulo Oses, Ian S Acuña-Rodríguez, Fabiana Antognoni, Enrique A Martinez-Mosqueira, Amadou Coulibaly, Alipio Canahua-Murillo, Milton Pinto, and Andrés Zurita-Silva. 2014. “Quinoa biodiversity and sustainability for food security under climate change. A review.” Agronomy for sustainable development no. 34 (2):349-359. Sigsgaard, Lene, Sven Erik Jacobsen, and Jørgen Lindskrog Christiansen. 2008. “Quinoa, Chenopodium quinoa, provides a new host for native herbivores in northern Europe: Case studies of the moth, Scrobipalpa atriplicella, and the tortoise beetle, Cassida nebulosa.” Journal of Insect Science no. 8 (1):50. Siro, Istvan, Emese Kapolna, Beáta Kápolna, and Andrea Lugasi. 2008. “Functional food. Product development, marketing and consumer acceptance—A review.” Appetite no. 51 (3):456-467. Vega‐Gálvez, Antonio, Margarita Miranda, Judith Vergara, Elsa Uribe, Luis Puente, and Enrique A Martínez. 2010. “Nutrition facts and functional potential of quinoa (Chenopodium quinoa willd. ), an ancient Andean grain: a review.” Journal of the Science of Food and Agriculture no. 90 (15):2541-2547. Villa, Diana Yamile Gallego, Luigi Russo, Khawla Kerbab, Maddalena Landi, and Luca Rastrelli. 2014. “Chemical and nutritional characterization of Chenopodium pallidicaule (cañihua) and Chenopodium quinoa (quinoa) seeds.” Emirates Journal of Food and Agriculture no. 26 (7):609. Walsh-Dilley, Marygold. 2013. “Negotiating hybridity in highland Bolivia: indigenous moral economy and the expanding market for quinoa.” Journal of Peasant Studies no. 40 (4):659-682. Aguilar, Pablo Cesar, and Sven-Erik Jacobsen. 2003. “Cultivation of quinoa on the Peruvian Altiplano.” Food Reviews International no. 19 (1-2):31-41. Burke, Ingrid C, CM Yonker, WJ Parton, CV Cole, DS Schimel, and K Flach. 1989. “Texture, climate, and cultivation effects on soil organic matter content in US grassland soils.” Soil Science Society of America Journal no. 53 (3):800-805. Hoekstra, Folkert A, Elena A Golovina, and Julia Buitink. 2001. “Mechanisms of plant desiccation tolerance.” Trends in plant science no. 6 (9):431-438. Jacobsen, S-E, I Jørgensen, and O Stølen. 1994. “Cultivation of quinoa (Chenopodium quinoa) under temperate climatic conditions in Denmark.” The Journal of Agricultural Science no. 122 (01):47-52. Jacobsen, S-E, A Mujica, and CR Jensen. 2003. “The resistance of quinoa (Chenopodium quinoa Willd.) to adverse abiotic factors.” Food Reviews International no. 19 (1-2):99-109. McKey, Doyle, Marianne Elias, Benoît Pujol, and Anne Duputié. 2010. “The evolutionary ecology of clonally propagated domesticated plants.” New Phytologist no. 186 (2):318-332. Rao, Anand B, and Edward S Rubin. 2002. “A technical, economic, and environmental assessment of amine-based CO2 capture technology for power plant greenhouse gas control.” Environmental science & technology no. 36 (20):4467-4475. Stigter, Kees. 2010. “Development of Microclimate Modification Patterns in Forestry.” In Applied Agrometeorology, 563-565. Springer. Teasdale, John R, Thomas E Devine, Jorge A Mosjidis, Robin R Bellinder, and C Edward Beste. 2004. “Growth and development of hairy vetch cultivars in the northeastern United States as influenced by planting and harvesting date.” Agronomy Journal no. 96 (5):1266-1271. Albanese, Anthony. 2012. Protein and amino acid nutrition: Elsevier. Alberts, David S, María Elena Martínez, Denise J Roe, José M Guillén-Rodríguez, James R Marshall, J Barbara Van Leeuwen, Mary E Reid, Cheryl Ritenbaugh, Perla A Vargas, and AB Bhattacharyya. 2000. “Lack of effect of a high-fiber cereal supplement on the recurrence of colorectal adenomas.” New England Journal of Medicine no. 342 (16):1156-1162. Anderson, James W, Pat Baird, Richard H Davis, Stefanie Ferreri, Mary Knudtson, Ashraf Koraym, Valerie Waters, and Christine L Williams. 2009. “Health benefits of dietary fiber.” Nutrition reviews no. 67 (4):188-205. Bédié, Gerard K, Sylvie L Turgeon, and Joseph Makhlouf. 2008. “Formation of native whey protein isolate–low methoxyl pectin complexes as a matrix for hydro-soluble food ingredient entrapment in acidic foods.” Food Hydrocolloids no. 22 (5):836-844. Bacher, A, S Eberhardt, M Fischer, K Kis, and G Richter. 2000. “Biosynthesis of vitamin B2 (riboflavin).” Annual review of nutrition no. 20 (1):153-167. Baker, Paul RS, Yiming Lin, Francisco J Schopfer, Steven R Woodcock, Alison L Groeger, Carlos Batthyany, Scott Sweeney, Marshall H Long, Karen E Iles, and Laura MS Baker. 2005. “Fatty Acid Transduction of Nitric Oxide Signaling multiple nitrated unsaturated fatty acid derivatives exist in human blood and urine and serve as endogenous peroxisome proliferator-activated receptor ligands.” Journal of Biological Chemistry no. 280 (51):42464-42475. Barbarino, Elisabete, and Sergio O Lourenço. 2005. “An evaluation of methods for extraction and quantification of protein from marine macro-and microalgae.” Journal of Applied Phycology no. 17 (5):447-460. Bhargava, Atul, Sudhir Shukla, and Deepak Ohri. 2006. 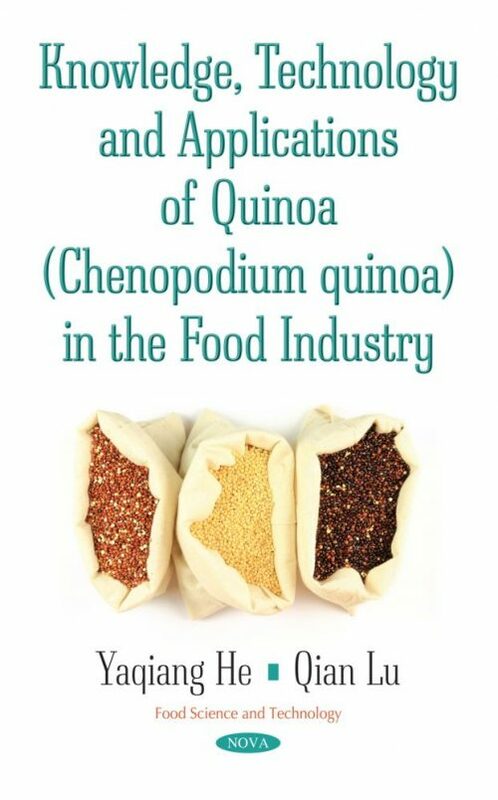 “Chenopodium quinoa—an Indian perspective.” Industrial crops and products no. 23 (1):73-87. Bruin, A de. 1964. “Investigation of the food value of quinua and cañihua seed.” Journal of Food Science no. 29 (6):872-876. Chen, Chung-Yen, Paul E Milbury, Karen Lapsley, and Jeffrey B Blumberg. 2005. “Flavonoids from almond skins are bioavailable and act synergistically with vitamins C and E to enhance hamster and human LDL resistance to oxidation.” The journal of nutrition no. 135 (6):1366-1373. Dini, A, Luca Rastrelli, Paola Saturnino, and O Schettino. 1992. “A compositional study of Chenopodium quinoa seeds.” Molecular Nutrition & Food Research no. 36 (4):400-404. Esposito, Fabrizio, Guido Arlotti, Angela Maria Bonifati, Aurora Napolitano, Davide Vitale, and Vincenzo Fogliano. 2005. “Antioxidant activity and dietary fibre in durum wheat bran by-products.” Food Research International no. 38 (10):1167-1173. Foster, Gary D, Holly R Wyatt, James O Hill, Brian G McGuckin, Carrie Brill, B Selma Mohammed, Philippe O Szapary, Daniel J Rader, Joel S Edman, and Samuel Klein. 2003. “A randomized trial of a low-carbohydrate diet for obesity.” New England Journal of Medicine no. 348 (21):2082-2090. Guerzoni, M Elisabetta, Rosalba Lanciotti, and P Sandro Cocconcelli. 2001. “Alteration in cellular fatty acid composition as a response to salt, acid, oxidative and thermal stresses in Lactobacillus helveticus.” Microbiology no. 147 (8):2255-2264. Jacobsen, Sven-Erik. 2003. “The worldwide potential for quinoa (Chenopodium quinoa Willd. ).” Food reviews international no. 19 (1-2):167-177. Jiang, Lei, Lin He, and Michael Fountoulakis. 2004. “Comparison of protein precipitation methods for sample preparation prior to proteomic analysis.” Journal of Chromatography A no. 1023 (2):317-320. Knothe, Gerhard. 2005. “Dependence of biodiesel fuel properties on the structure of fatty acid alkyl esters.” Fuel processing technology no. 86 (10):1059-1070. Konishi, Yotaro, Shigeru Hirano, Hideki Tsuboi, and Masao Wada. 2004. “Distribution of minerals in quinoa (Chenopodium quinoa Willd.) seeds.” Bioscience, biotechnology, and biochemistry no. 68 (1):231-234. Kozioł, MJ. 1992. “Chemical composition and nutritional evaluation of quinoa (Chenopodium quinoa Willd. ).” Journal of Food Composition and Analysis no. 5 (1):35-68. Kuhajda, Francis P. 2000. “Fatty-acid synthase and human cancer: new perspectives on its role in tumor biology.” Nutrition no. 16 (3):202-208. Liu, Simin, Walter C Willett, Meir J Stampfer, Frank B Hu, Mary Franz, Laura Sampson, Charles H Hennekens, and JoAnn E Manson. 2000. “A prospective study of dietary glycemic load, carbohydrate intake, and risk of coronary heart disease in US women.” The American Journal of Clinical Nutrition no. 71 (6):1455-1461. Lombard, Vincent, Hemalatha Golaconda Ramulu, Elodie Drula, Pedro M Coutinho, and Bernard Henrissat. 2014. “The carbohydrate-active enzymes database (CAZy) in 2013.” Nucleic acids research no. 42 (D1):D490-D495. Lopes, C de O, GV Dessimoni, MC Da Silva, G Vieira, and NAVD Pinto. 2009. “Nutritional and non nutritional characterization of quinoa (Chenopodium quinoa).” Alimentos e Nutrição no. 20 (4):669-675. Macfarlane, Sandra, and George T Macfarlane. 2003. “Regulation of short-chain fatty acid production.” Proceedings of the Nutrition Society no. 62 (01):67-72. Marlett, Judith A, Michael I McBurney, and Joanne L Slavin. 2002. “Position of the American Dietetic Association: health implications of dietary fiber.” Journal of the American Dietetic Association no. 102 (7):993-1000. Park, PK, EY Kim, and KH Chu. 2007. “Chemical disruption of yeast cells for the isolation of carotenoid pigments.” Separation and Purification Technology no. 53 (2):148-152. Rüegg, Johann C. 2012. Calcium in muscle contraction: cellular and molecular physiology: Springer Science & Business Media. Repo-Carrasco, Ritva, Clara Espinoza, and S-E Jacobsen. 2003. “Nutritional value and use of the Andean crops quinoa (Chenopodium quinoa) and kañiwa (Chenopodium pallidicaule).” Food reviews international no. 19 (1-2):179-189. Ruales, Jenny, and Baboo M Nair. 1993. “Saponins, phytic acid, tannins and protease inhibitors in quinoa (Chenopodium quinoa, Willd) seeds.” Food Chemistry no. 48 (2):137-143. Sampath, Harini, and James M Ntambi. 2005. “Polyunsaturated fatty acid regulation of genes of lipid metabolism.” Annu. Rev. Nutr. no. 25:317-340. Slavin, JL. 2008. “Position of the American Dietetic Association: health implications of dietary fiber.” Journal of the American Dietetic Association no. 108 (10):1716-1731. Solíz-Guerrero, José Bernardo, Diana Jasso De Rodriguez, Raúl Rodríguez-García, José Luis Angulo-Sánchez, and Guadalupe Méndez-Padilla. 2002. “Quinoa saponins: concentration and composition analysis.” Trends in new crops and new uses:110-114. Spiro, Robert G. 2002. “Protein glycosylation: nature, distribution, enzymatic formation, and disease implications of glycopeptide bonds.” Glycobiology no. 12 (4):43R-56R. Srinivas-Shankar, Upendram, Stephen A Roberts, Martin J Connolly, Matthew DL O'Connell, Judith E Adams, Jackie A Oldham, and Frederick CW Wu. 2010. “Effects of testosterone on muscle strength, physical function, body composition, and quality of life in intermediate-frail and frail elderly men: a randomized, double-blind, placebo-controlled study.” The Journal of Clinical Endocrinology & Metabolism no. 95 (2):639-650. Valueva, TA, and VV Mosolov. 2004. “Role of inhibitors of proteolytic enzymes in plant defense against phytopathogenic microorganisms.” Biochemistry (Moscow) no. 69 (11):1305-1309. Walker, Alan W, Sylvia H Duncan, E Carol McWilliam Leitch, Matthew W Child, and Harry J Flint. 2005. “pH and peptide supply can radically alter bacterial populations and short-chain fatty acid ratios within microbial communities from the human colon.” Applied and Environmental Microbiology no. 71 (7):3692-3700. Wang, Wei, Monica Scali, Rita Vignani, Antonia Spadafora, Elisabetta Sensi, Silvia Mazzuca, and Mauro Cresti. 2003. “Protein extraction for two‐dimensional electrophoresis from olive leaf, a plant tissue containing high levels of interfering compounds.” Electrophoresis no. 24 (14):2369-2375. Wright, KH, OA Pike, DJ Fairbanks, and CS Huber. 2002. “Composition of Atriplex hortensis, sweet and bitter Chenopodium quinoa seeds.” Journal of food science no. 67 (4):1383-1385. Bárcenas, María Eugenia, Jessica De la O-Keller, and Cristina M Rosell. 2009. “Influence of different hydrocolloids on major wheat dough components (gluten and starch).” Journal of Food Engineering no. 94 (3):241-247. Chen, Yi-Tien, Sy-Yu Shiau, and Jhong-Tai Fu. 2016. “Physicochemical Properties of Dough and Steamed Bread Made from Regular and Whole Wheat Flour.” International Journal of Food Engineering no. 12 (4):411-419. Curic, D, Dubravka Novotni, D Skevin, Cristina M Rosell, Concha Collar, Alain Le Bail, I Colic-Baric, and D Gabric. 2008. “Design of a quality index for the objective evaluation of bread quality: Application to wheat breads using selected bake off technology for bread making.” Food research international no. 41 (7):714-719. Curtis, Tanya Y, Nira Muttucumaru, Peter R Shewry, Martin AJ Parry, Stephen J Powers, J Stephen Elmore, Donald S Mottram, Simon Hook, and Nigel G Halford. 2009. “Effects of genotype and environment on free amino acid levels in wheat grain: implications for acrylamide formation during processing.” Journal of Agricultural and Food Chemistry no. 57 (3):1013-1021. Gómez, Manuel, Bonastre Oliete, Cristina M Rosell, Valentín Pando, and Encarnación Fernández. 2008. “Studies on cake quality made of wheat–chickpea flour blends.” LWT-Food Science and Technology no. 41 (9):1701-1709. Ghodke, SK, Laxmi Ananthanarayan, and Lambert Rodrigues. 2009. “Use of response surface methodology to investigate the effects of milling conditions on damaged starch, dough stickiness and chapatti quality.” Food Chemistry no. 112 (4):1010-1015. Hager, Anna-Sophie, Anika Wolter, Mariko Czerny, Jürgen Bez, Emanuele Zannini, Elke K Arendt, and Michael Czerny. 2012. “Investigation of product quality, sensory profile and ultrastructure of breads made from a range of commercial gluten-free flours compared to their wheat counterparts.” European Food Research and Technology no. 235 (2):333-344. Jiang, Zhengqiang, Qianqian Cong, Qiaojuan Yan, Narasimha Kumar, and Xuedan Du. 2010. “Characterisation of a thermostable xylanase from Chaetomium sp. and its application in Chinese steamed bread.” Food Chemistry no. 120 (2):457-462. Koellinger, Philipp. 2008. “The relationship between technology, innovation, and firm performance—Empirical evidence from e-business in Europe.” Research policy no. 37 (8):1317-1328. Koutinas, Athanasios A, Harris Papapostolou, Dimitra Dimitrellou, Nikolaos Kopsahelis, Eleftheria Katechaki, Argyro Bekatorou, and Loulouda A Bosnea. 2009. “Whey valorisation: A complete and novel technology development for dairy industry starter culture production.” Bioresource Technology no. 100 (15):3734-3739. Lagrain, Bert, Pedro Leman, Hans Goesaert, and Jan A Delcour. 2008. “Impact of thermostable amylases during bread making on wheat bread crumb structure and texture.” Food research international no. 41 (8):819-827. Leblanc, Nathalie, Redouan Saiah, Eric Beucher, Richard Gattin, Michel Castandet, and Jean-Marc Saiter. 2008. “Structural investigation and thermal stability of new extruded wheat flour based polymeric materials.” Carbohydrate polymers no. 73 (4):548-557. Lin, Li-Yun, Hsiu-Man Liu, Ya-Wen Yu, Sheng-Dun Lin, and Jeng-Leun Mau. 2009. “Quality and antioxidant property of buckwheat enhanced wheat bread.” Food Chemistry no. 112 (4):987-991. Liu, Chong, Limin Li, Jing Hong, Xueling Zheng, Ke Bian, Yu Sun, and Jie Zhang. 2014. “Effect of mechanically damaged starch on wheat flour, noodle and steamed bread making quality.” International Journal of Food Science & Technology no. 49 (1):253-260. Miś, Antoni, Stanisław Grundas, Dariusz Dziki, and Janusz Laskowski. 2012. “Use of farinograph measurements for predicting extensograph traits of bread dough enriched with carob fibre and oat wholemeal.” Journal of Food Engineering no. 108 (1):1-12. Pareyt, Bram, and Jan A Delcour. 2008. “The role of wheat flour constituents, sugar, and fat in low moisture cereal based products: a review on sugar-snap cookies.” Critical reviews in food science and nutrition no. 48 (9):824-839. Peppers, Don, and Martha Rogers. 2012. “A new marketing paradigm: share of customer, not market share.” Managing Service Quality: An International Journal. Richtnér, Anders, and Pär Åhlström. 2010. “Top management control and knowledge creation in new product development.” International Journal of Operations & Production Management no. 30 (10):1006-1031. Rosales-Juárez, Maribel, Beatriz González-Mendoza, Emigdio C López-Guel, Flora Lozano-Bautista, Jorge Chanona-Pérez, Gustavo Gutiérrez-López, Reynold Farrera-Rebollo, and Georgina Calderón-Domínguez. 2008. “Changes on dough rheological characteristics and bread quality as a result of the addition of germinated and non-germinated soybean flour.” Food and Bioprocess Technology no. 1 (2):152-160. Sim, SY, AA Noor Aziah, and LH Cheng. 2011. “Characteristics of wheat dough and Chinese steamed bread added with sodium alginates or konjac glucomannan.” Food Hydrocolloids no. 25 (5):951-957. Skendi, A, CG Biliaderis, M Papageorgiou, and MS Izydorczyk. 2010. “Effects of two barley β-glucan isolates on wheat flour dough and bread properties.” Food Chemistry no. 119 (3):1159-1167. Teece, David J. 2010. “Business models, business strategy and innovation.” Long range planning no. 43 (2):172-194. Wang, Sunan, Akarin Opassathavorn, and Fan Zhu. 2015. “Influence of quinoa flour on quality characteristics of cookie, bread and Chinese steamed bread.” Journal of Texture Studies no. 46 (4):281-292. Wang, Sunan, and Fan Zhu. 2016. “Formulation and quality attributes of quinoa food products.” Food and bioprocess technology no. 9 (1):49-68. Wu, Ming-Yin, Yung-Ho Chang, Sy-Yu Shiau, and Cheng-Chang Chen. 2012. “Rheology of Fiber-Enriched Steamed Bread: Stress Relaxation and Texture Profile Analysis.” Journal of Food & Drug Analysis no. 20 (1). Xu, Fang‐Yi, Qing‐Han Gao, Yu‐Jie Ma, Xu‐Dan Guo, and Min Wang. 2014. “Comparison of tartary buckwheat flour and sprouts steamed bread in quality and antioxidant property.” Journal of Food Quality no. 37 (5):318-328. Zhu, Fan. 2014. “Influence of ingredients and chemical components on the quality of Chinese steamed bread.” Food chemistry no. 163:154-162. Abugoch, Lilian E, Cristián Tapia, Maria C Villamán, Mehrdad Yazdani-Pedram, and Mario Díaz-Dosque. 2011. “Characterization of quinoa protein–chitosan blend edible films.” Food Hydrocolloids no. 25 (5):879-886. Barrera, Gabriela N, Mariela C Bustos, Laura Iturriaga, Silvia K Flores, Alberto E León, and Pablo D Ribotta. 2013. “Effect of damaged starch on the rheological properties of wheat starch suspensions.” Journal of Food Engineering no. 116 (1):233-239. Chen, JS, MJ Fei, CL Shi, JC Tian, CL Sun, H Zhang, Z Ma, and HX Dong. 2011. “Effect of particle size and addition level of wheat bran on quality of dry white Chinese noodles.” Journal of Cereal Science no. 53 (2):217-224. Courtin, CM, and J Al Delcour. 2002. “Arabinoxylans and endoxylanases in wheat flour bread-making.” Journal of cereal science no. 35 (3):225-243. Goesaert, Hans, Kristof Brijs, WS Veraverbeke, CM Courtin, Kurt Gebruers, and JA Delcour. 2005. “Wheat flour constituents: how they impact bread quality, and how to impact their functionality.” Trends in food science & technology no. 16 (1):12-30. Gong, Yiwen, Yimin Yang, David K Ferguson, Dawei Tao, Wenying Li, Changsui Wang, Enguo Lü, and Hongen Jiang. 2011. “Investigation of ancient noodles, cakes, and millet at the Subeixi Site, Xinjiang, China.” Journal of Archaeological Science no. 38 (2):470-479. Hou, Gary G. 2011. Asian noodles: Science, technology, and processing: John Wiley & Sons. Kaushik, Jaya Shankar, Manish Narang, and Ankit Parakh. 2011. “Fast food consumption in children.” Indian Pediatrics no. 48 (2):97-101. Kiatkamjornwong, Suda, Wararuk Chomsaksakul, and Manit Sonsuk. 2000. “Radiation modification of water absorption of cassava starch by acrylic acid/acrylamide.” Radiation Physics and Chemistry no. 59 (4):413-427. Kushner, Barak. 2012. Slurp! : A Social and Culinary History of Ramen, Japan's Favorite Noodle Soup: Global Oriental Leiden. Markowski, M, S Cenkowski, DW Hatcher, JE Dexter, and NM Edwards. 2003. “The effect of superheated-steam dehydration kinetics on textural properties of Asian noodles.” Transactions-American Society Of Agricultural Engineers no. 46 (2):389-396. MORITA, Naofumi, Tomoko MAEDA, Megumi MIYAZAKI, Makoto YAMAMORI, Hideho MIURA, and Ichiro OHTSUKA. 2002. “Effect of substitution of waxy-wheat flour for common flour on dough and baking properties.” Food Science and Technology Research no. 8 (2):119-124. Purwandari, U, A Khoiri, M Muchlis, B Noriandita, NF Zeni, N Lisdayana, and E Fauziyah. 2014. “Textural, cooking quality, and sensory evaluation of gluten-free noodle made from breadfruit, konjac, or pumpkin flour.” International Food Research Journal no. 21 (4). Stikic, Radmila, Djordje Glamoclija, Mirjana Demin, Biljana Vucelic-Radovic, Zorica Jovanovic, Dusanka Milojkovic-Opsenica, Sven-Erik Jacobsen, and Mirjana Milovanovic. 2012. “Agronomical and nutritional evaluation of quinoa seeds (Chenopodium quinoa Willd.) as an ingredient in bread formulations.” Journal of Cereal Science no. 55 (2):132-138. Tabassum, Ayesha, and Tasnuva Rahman. 2012. “Differences in consumer attitude towards selective fast food restaurants in Bangladesh: An implication of multiattribute attitude model.” World Review of Business Research no. 2 (3):12-27. Talbert, Luther E, Petrea Hofer, Deanna Nash, John M Martin, Susan P Lanning, Jamie D Sherman, and Michael J Giroux. 2016. “Hard white versus hard red wheats: taste tests and milling and baking properties.” Journal of Cereal Science no. 71:153-159. Verma, Akhilesh K, V Pathak, and VP Singh. 2013. “Cost of formulation for chicken meat noodles using whole wheat and rice flour.” Indian Journal of Poultry Science no. 48 (2):261-264. Beasley, HL, S Uthayakumaran, FL Stoddard, SJ Partridge, L Daqiq, P Chong, and F Békés. 2002. “Synergistic and additive effects of three high molecular weight glutenin subunit loci. II. Effects on wheat dough functionality and end-use quality.” Cereal chemistry no. 79 (2):301-307. Bolade, Mathew Kolawole, and Isaac Adebayo Adeyemi. 2012. “Functionality enhancement of composite cassava flour in the production of maize tuwo (a non-fermented maize-based food dumpling).” Food and Bioprocess Technology no. 5 (4):1340-1348. Branen, A Larry, P Michael Davidson, Seppo Salminen, and John Thorngate. 2001. Food additives: CRC Press. Crinnion, Walter J. 2010. “Organic foods contain higher levels of certain nutrients, lower levels of pesticides, and may provide health benefits for the consumer.” Alternative Medicine Review no. 15 (1):4-13. Epstein, Leonard H, Constance C Gordy, Hollie A Raynor, Marlene Beddome, Colleen K Kilanowski, and Rocco Paluch. 2001. “Increasing fruit and vegetable intake and decreasing fat and sugar intake in families at risk for childhood obesity.” Obesity research no. 9 (3):171-178. Gao, Xueqin, Wangang Zhang, and Guanghong Zhou. 2014. “Effects of glutinous rice flour on the physiochemical and sensory qualities of ground pork patties.” LWT-Food Science and Technology no. 58 (1):135-141. Guo, Li, Juanjuan Zhang, Jian Hu, Xueling Li, and Xianfeng Du. 2015. “Susceptibility of glutinous rice starch to digestive enzymes.” Carbohydrate polymers no. 128:154-162. Li, Si Yi, and Ya Ping Yang. 2012. The innovation design of the molding method and machine about non spherical sweet dumpling. Paper read at Applied Mechanics and Materials. Mi, Jia, Yan Liang, Yanmin Lu, Congping Tan, and Bo Cui. 2014. “Influence of acetylated potato starch on the properties of dumpling wrapper.” Industrial Crops and Products no. 56:113-117. Monti, Andrea, Nicola Di Virgilio, and Gianpietro Venturi. 2008. “Mineral composition and ash content of six major energy crops.” Biomass and Bioenergy no. 32 (3):216-223. Nasser, J. 2001. “Taste, food intake and obesity.” Obesity Reviews no. 2 (4):213-218. Oerke, E-C, H-W Dehne, Fritz Schönbeck, and Adolf Weber. 2012. Crop production and crop protection: estimated losses in major food and cash crops: Elsevier. Okahisa, Naoki, Yasuhiro Inatsu, Vijay K Juneja, and Shinichi Kawamoto. 2008. “Evaluation and control of the risk of foodborne pathogens and spoilage bacteria present in Awa-Uirou, a sticky rice cake containing sweet red bean paste.” Foodborne pathogens and disease no. 5 (3):351-359. Phan-Thien, Nhan, and Mohsen Safari-Ardi. 1998. “Linear viscoelastic properties of flour–water doughs at different water concentrations.” Journal of Non-Newtonian Fluid Mechanics no. 74 (1):137-150. Russell, Laura B. 2011. The Gluten-free Asian Kitchen: Recipes for Noodles, Dumplings, Sauces, and More: Celestial Arts. Sacchetti, G, GG Pinnavaia, E Guidolin, and M Dalla Rosa. 2004. “Effects of extrusion temperature and feed composition on the functional, physical and sensory properties of chestnut and rice flour-based snack-like products.” Food Research International no. 37 (5):527-534. Schmidt, Veronika M, Dirk Louis P Schorkopf, Michael Hrncir, Ronaldo Zucchi, and Friedrich G Barth. 2006. “Collective foraging in a stingless bee: dependence on food profitability and sequence of discovery.” Animal Behaviour no. 72 (6):1309-1317. Weickert, Martin O, and Andreas FH Pfeiffer. 2008. “Metabolic effects of dietary fiber consumption and prevention of diabetes.” The Journal of nutrition no. 138 (3):439-442. Assy, Nimer, Gattas Nasser, Iad Kamayse, William Nseir, Zaza Beniashvili, Agness Djibre, and Maria Grosovski. 2008. “Soft drink consumption linked with fatty liver in the absence of traditional risk factors.” Canadian Journal of Gastroenterology and Hepatology no. 22 (10):811-816. Brennan, Charles, Margaret Brennan, Emma Derbyshire, and Brijesh K Tiwari. 2011. “Effects of extrusion on the polyphenols, vitamins and antioxidant activity of foods.” Trends in Food Science & Technology no. 22 (10):570-575. Castro, WF, LRB Mariutti, and N Bragagnolo. 2011. “The effects of colorifico on lipid oxidation, colour and vitamin E in raw and grilled chicken patties during frozen storage.” Food chemistry no. 124 (1):126-131. Das, Kunal, Dipa Ray, NR Bandyopadhyay, Anirudhha Gupta, Suparna Sengupta, Saswata Sahoo, Amar Mohanty, and Manjusri Misra. 2010. “Preparation and characterization of cross-linked starch/poly (vinyl alcohol) green films with low moisture absorption.” Industrial & Engineering Chemistry Research no. 49 (5):2176-2185. Grimes, Carley A, Lynn J Riddell, and Caryl A Nowson. 2009. “Consumer knowledge and attitudes to salt intake and labelled salt information.” Appetite no. 53 (2):189-194. Ha, Eun-Jeong, Natalie Caine-Bish, Christopher Holloman, and Karen Lowry-Gordon. 2009. “Evaluation of effectiveness of class-based nutrition intervention on changes in soft drink and milk consumption among young adults.” Nutrition journal no. 8 (1):50. He, Feng J, Naomi M Marrero, and Graham A MacGregor. 2008. “Salt intake is related to soft drink consumption in children and adolescents.” Hypertension no. 51 (3):629-634. Holz, Martina, André Förster, Stephan Mauersberger, and Gerold Barth. 2009. “Aconitase overexpression changes the product ratio of citric acid production by Yarrowia lipolytica.” Applied microbiology and biotechnology no. 81 (6):1087-1096. Miyazato, Shoko, Chie Nakagawa, Yuka Kishimoto, Hiroyuki Tagami, and Hiroshi Hara. 2010. “Promotive effects of resistant maltodextrin on apparent absorption of calcium, magnesium, iron and zinc in rats.” European journal of nutrition no. 49 (3):165-171. Motevali, Ali, Saeid Minaei, and Mohammad Hadi Khoshtagaza. 2011. “Evaluation of energy consumption in different drying methods.” Energy Conversion and Management no. 52 (2):1192-1199. Navarro-Alarcon, Miguel, and Carmen Cabrera-Vique. 2008. “Selenium in food and the human body: a review.” Science of the total environment no. 400 (1):115-141. Reutskaja, Elena, Rosemarie Nagel, Colin F Camerer, and Antonio Rangel. 2011. “Search dynamics in consumer choice under time pressure: An eye-tracking study.” The American Economic Review no. 101 (2):900-926. Sandell, Lisa L, Megan L Lynn, Kimberly E Inman, William McDowell, and Paul A Trainor. 2012. “RDH10 oxidation of Vitamin A is a critical control step in synthesis of retinoic acid during mouse embryogenesis.” PloS one no. 7 (2):e30698. Santini, Antonello, Rosalia Ferracane, Petra Mikušová, Štefan Eged, Antonia Šrobárová, Giuseppe Meca, Jordi Mañes, and Alberto Ritieni. 2011. “Influence of different coffee drink preparations on ochratoxin A content and evaluation of the antioxidant activity and caffeine variations.” Food Control no. 22 (8):1240-1245. Soylak, Mustafa, Yunus Emre Unsal, Erkan Yilmaz, and Mustafa Tuzen. 2011. “Determination of rhodamine B in soft drink, waste water and lipstick samples after solid phase extraction.” Food and chemical toxicology no. 49 (8):1796-1799. Stella, Suzana P, Alessandra C Ferrarezi, Karina O dos Santos, and Magali Monteiro. 2011. “Antioxidant Activity of Commercial Ready‐to‐Drink Orange Juice and Nectar.” Journal of food science no. 76 (3):C392-C397. Tang, Jason E, Daniel R Moore, Gregory W Kujbida, Mark A Tarnopolsky, and Stuart M Phillips. 2009. “Ingestion of whey hydrolysate, casein, or soy protein isolate: effects on mixed muscle protein synthesis at rest and following resistance exercise in young men.” Journal of applied physiology no. 107 (3):987-992. Weinbreck, F, I Bodnár, and ML Marco. 2010. “Can encapsulation lengthen the shelf-life of probiotic bacteria in dry products?” International journal of food microbiology no. 136 (3):364-367. White, James P, Jacob M Wilson, Krista G Austin, Beau K Greer, Noah St John, and Lynn B Panton. 2008. “Effect of carbohydrate-protein supplement timing on acute exercise-induced muscle damage.” Journal of the International Society of Sports Nutrition no. 5 (1):5. Wu, Di, Yong He, Shuijuan Feng, and Da-Wen Sun. 2008. “Study on infrared spectroscopy technique for fast measurement of protein content in milk powder based on LS-SVM.” Journal of Food Engineering no. 84 (1):124-131. Abdulmumeen, Hamid A, Ahmed N Risikat, and Agboola R Sururah. 2012. “Food: Its preservatives, additives and applications.” International Journal of Chemical and Biochemical Sciences no. 1 (2012):36-47. Al-Dmoor, Hanee M. 2013. “Cake flour: functionality and quality.” European Scientific Journal, ESJ no. 9 (3). Cintra, Dennys E, Eduardo R Ropelle, Juliana C Moraes, Jose R Pauli, Joseane Morari, Claudio T de Souza, Renato Grimaldi, Marcela Stahl, Jose B Carvalheira, and Mario J Saad. 2012. “Unsaturated fatty acids revert diet-induced hypothalamic inflammation in obesity.” PloS one no. 7 (1):e30571. Di Luccio, Marco, Fernando Capra, Najara P Ribeiro, Gean DLP Vargas, Denise MG Freire, and Débora De Oliveira. 2004. Effect of temperature, moisture, and carbon supplementation on lipase production by solid-state fermentation of soy cake by Penicillium simplicissimum. Paper read at Proceedings of the Twenty-Fifth Symposium on Biotechnology for Fuels and Chemicals Held May 4–7, 2003, in Breckenridge, CO.
Galli, Corraldo. 2013. Dietary ω3 and ω6 fatty acids: biological effects and nutritional essentiality. Vol. 171: Springer Science & Business Media. Guardia, Pablo, Riccardo Di Corato, Lenaic Lartigue, Claire Wilhelm, Ana Espinosa, Mar Garcia-Hernandez, Florence Gazeau, Liberato Manna, and Teresa Pellegrino. 2012. “Water-soluble iron oxide nanocubes with high values of specific absorption rate for cancer cell hyperthermia treatment.” ACS nano no. 6 (4):3080-3091. Jeong, Sohee, Wie-Soo Kang, and Malshick Shin. 2013. “Improvement of the quality of gluten-free rice pound cake using extruded rice flour.” Food Science and Biotechnology no. 22 (1):173-180. Kim, Soyoung, and Briana Martinez. 2013. “Fashion consumer groups and online shopping at private sale sites.” International Journal of Consumer Studies no. 37 (4):367-372. Mani, Nivedita, and Falk Huettig. 2012. “Prediction during language processing is a piece of cake—But only for skilled producers.” Journal of Experimental Psychology: Human Perception and Performance no. 38 (4):843. Prückler, Michael, Susanne Siebenhandl-Ehn, Silvia Apprich, Stefan Höltinger, Cornelia Haas, Erwin Schmid, and Wolfgang Kneifel. 2014. “Wheat bran-based biorefinery 1: Composition of wheat bran and strategies of functionalization.” LWT-Food Science and Technology no. 56 (2):211-221. Rodríguez‐García, Julia, Ana Puig, Ana Salvador, and Isabel Hernando. 2012. “Optimization of a sponge cake formulation with inulin as fat replacer: structure, physicochemical, and sensory properties.” Journal of Food Science no. 77 (2):C189-C197. Rucker, Derek D, Adam D Galinsky, and David Dubois. 2012. “Power and consumer behavior: How power shapes who and what consumers value.” Journal of Consumer Psychology no. 22 (3):352-368. Sójka, Michał, Elżbieta Klimczak, Jakub Macierzyński, and Krzysztof Kołodziejczyk. 2013. “Nutrient and polyphenolic composition of industrial strawberry press cake.” European Food Research and Technology no. 237 (6):995-1007. Santos, OV, NCF Corrêa, RN Carvalho, CEF Costa, LFF França, and SCS Lannes. 2013. “Comparative parameters of the nutritional contribution and functional claims of Brazil nut kernels, oil and defatted cake.” Food research international no. 51 (2):841-847. Schipilliti, Luisa, Ivana Lidia Bonaccorsi, and Luigi Mondello. 2016. “Characterization of natural vanilla flavour in foodstuff by HS‐SPME and GC‐C‐IRMS.” Flavour and Fragrance Journal. Sharoba, AM, MA Farrag, and AM Abd El-Salam. 2013. “Utilization of some fruits and vegetables waste as a source of dietary fiber and its effect on the cake making and its quality attributes.” Journal of Agroalimentary Processes and Technologies no. 19 (4):429-444. Weinberg, Joe, and Ryan Bakker. 2015. “Let them eat cake: food prices, domestic policy and social unrest.” Conflict Management and Peace Science no. 32 (3):309-326. Wiese, Tiffany D, and Melani W Duffrin. 2003. “Effects of substituting pawpaw fruit puree for fat on the sensory properties of a plain shortened cake.” HortTechnology no. 13 (3):442-444. Wilderjans, Edith, Annelies Luyts, Kristof Brijs, and Jan A Delcour. 2013. “Ingredient functionality in batter type cake making.” Trends in Food Science & Technology no. 30 (1):6-15. Zhao, Peitao, Yafei Shen, Shifu Ge, Zhenqian Chen, and Kunio Yoshikawa. 2014. “Clean solid biofuel production from high moisture content waste biomass employing hydrothermal treatment.” Applied Energy no. 131:345-367. Abele, Andrea E, and Bogdan Wojciszke. 2007. “Agency and communion from the perspective of self versus others.” Journal of personality and social psychology no. 93 (5):751. Fortin, David R, and Ruby Roy Dholakia. 2005. “Interactivity and vividness effects on social presence and involvement with a web-based advertisement.” Journal of business research no. 58 (3):387-396. Jayadas, NH, and K Prabhakaran Nair. 2006. “Coconut oil as base oil for industrial lubricants—evaluation and modification of thermal, oxidative and low temperature properties.” Tribology international no. 39 (9):873-878. Katsanos, Christos S, Hisamine Kobayashi, Melinda Sheffield-Moore, Asle Aarsland, and Robert R Wolfe. 2006. “A high proportion of leucine is required for optimal stimulation of the rate of muscle protein synthesis by essential amino acids in the elderly.” American Journal of Physiology-Endocrinology And Metabolism no. 291 (2):E381-E387. Koves, Timothy R, John R Ussher, Robert C Noland, Dorothy Slentz, Merrie Mosedale, Olga Ilkayeva, James Bain, Robert Stevens, Jason RB Dyck, and Christopher B Newgard. 2008. “Mitochondrial overload and incomplete fatty acid oxidation contribute to skeletal muscle insulin resistance.” Cell metabolism no. 7 (1):45-56. Lavie, Carl J, Richard V Milani, Mandeep R Mehra, and Hector O Ventura. 2009. “Omega-3 polyunsaturated fatty acids and cardiovascular diseases.” Journal of the American College of Cardiology no. 54 (7):585-594. Maffei, Helga Verena Leoni, and Andréa Pereira Vicentini. 2011. “Prospective evaluation of dietary treatment in childhood constipation: high dietary fiber and wheat bran intake are associated with constipation amelioration.” Journal of pediatric gastroenterology and nutrition no. 52 (1):55-59. Martínez, EA, E Veas, C Jorquera, R San Martín, and P Jara. 2009. “Re‐Introduction of Quínoa into Arid Chile: Cultivation of Two Lowland Races under Extremely Low Irrigation.” Journal of Agronomy and Crop Science no. 195 (1):1-10. Martin, Charles E, Chan-Seok Oh, and Yide Jiang. 2007. “Regulation of long chain unsaturated fatty acid synthesis in yeast.” Biochimica et Biophysica Acta (BBA)-Molecular and Cell Biology of Lipids no. 1771 (3):271-285. Nascimento, Ana Cláudia, Carla Mota, Inês Coelho, Sandra Gueifão, Mariana Santos, Ana Sofia Matos, Alejandra Gimenez, Manuel Lobo, Norma Samman, and Isabel Castanheira. 2014. “Characterisation of nutrient profile of quinoa (Chenopodium quinoa), amaranth (Amaranthus caudatus), and purple corn (Zea mays L.) consumed in the North of Argentina: proximates, minerals and trace elements.” Food chemistry no. 148:420-426. Rodriguez, Rocio, Ana Jimenez, Juan Fernández-Bolaños, Rafael Guillén, and Antonia Heredia. 2006. “Dietary fibre from vegetable products as source of functional ingredients.” Trends in Food Science & Technology no. 17 (1):3-15. Sim, Jeoung-Ha. 2006. “The effects of diet health education program for prehypertension group on the diet habit and blood pressure.” Korean Journal of Health Education and Promotion no. 23 (4):1-12. Slavin, Joanne L. 2005. “Dietary fiber and body weight.” Nutrition no. 21 (3):411-418. Uttara, Bayani, Ajay V Singh, Paolo Zamboni, and RT Mahajan. 2009. “Oxidative stress and neurodegenerative diseases: a review of upstream and downstream antioxidant therapeutic options.” Current neuropharmacology no. 7 (1):65-74. Valenzuela, Carolina, Lilian Abugoch, and Cristian Tapia. 2013. “Quinoa protein–chitosan–sunflower oil edible film: Mechanical, barrier and structural properties.” LWT-Food Science and Technology no. 50 (2):531-537. Zhang, Y-H Percival, Michael E Himmel, and Jonathan R Mielenz. 2006. “Outlook for cellulase improvement: screening and selection strategies.” Biotechnology advances no. 24 (5):452-481. Zhang, Yi, Xiujuan Wang, Li Li, Weiqing Li, Feng Zhang, Tianxin Du, and Xiaogang Chu. 2013. “Simultaneous determination of 23 flavor additives in tobacco products using gas chromatography–triple quadrupole mass spectrometry.” Journal of Chromatography A no. 1306:72-79. Zheng, Xiaozhong, Douglas R Tocher, Cathryn A Dickson, J Gordon Bell, and Alan J Teale. 2005. “Highly unsaturated fatty acid synthesis in vertebrates: new insights with the cloning and characterization of a Δ6 desaturase of Atlantic salmon.” Lipids no. 40 (1):13-24. The technicians in the field of wheat products processing will have interests in this book. This book provides a lot of useful information about wheat processing.